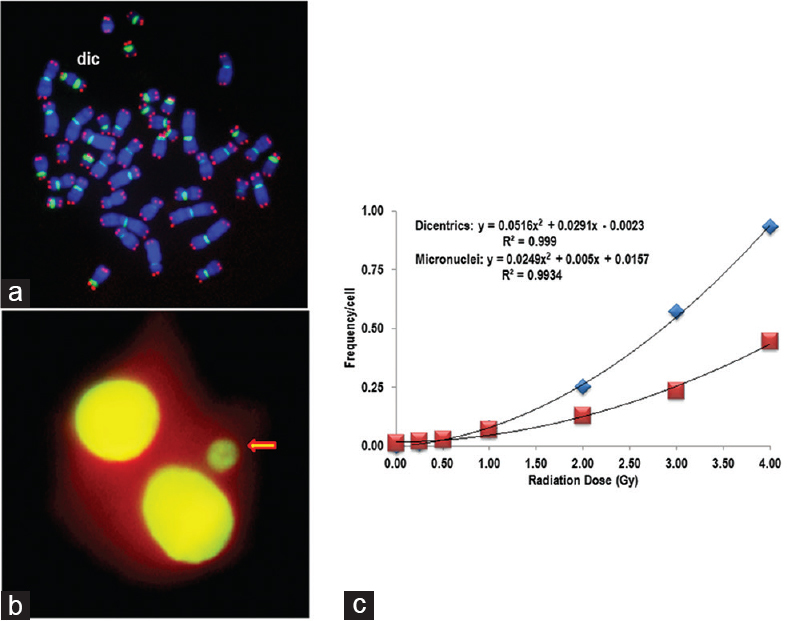 Biodosimetry methods, including the dicentric chromosome assay, the cytokinesis.block micronucleus assay and the γH2AX marker of DNA damage are used to determine the dose of ionizing radiation. These techniques are particularly useful when physical dosimetry is absent or questioned. While these assays can be very sensitive and specific, the standard methods need to be adapted to increase sample throughput in the case of a large.scale radiological/nuclear event. Recent modifications to the microscope.based assays have resulted in some increased throughput, and a number of biodosimetry networks have been, and continue to be, established and strengthened. As the imaging flow cytometer. (IFC) is a technology that can automatically image and analyze processed blood samples for markers of radiation damage, the microscope.based biodosimetry techniques can be modified for the IFC for high.throughput biological dosimetry. Furthermore, the analysis templates can be easily shared between networked biodosimetry laboratories for increased capacity and improved standardization. 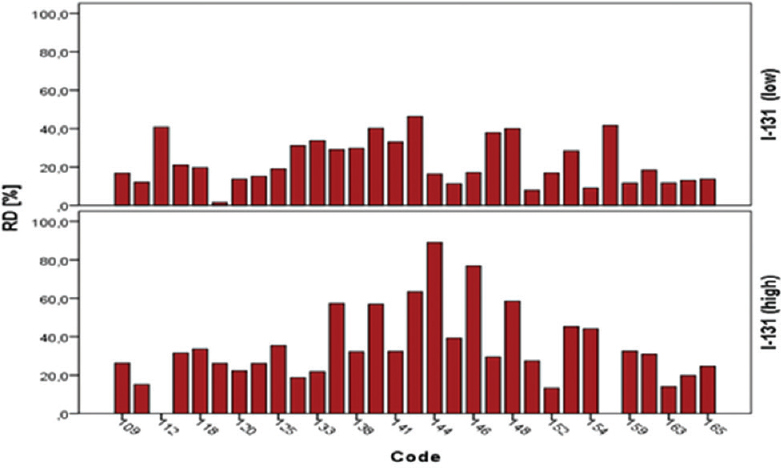 This review describes recent advances in IFC methodology and their application to biodosimetry. The absence of a rapid and high-throughput technology for radiation biodosimetry has been a great obstacle in our full preparedness to cope with large-scale radiological incidents. The existing cytogenetic technologies have limitations, primarily due to their time-consuming methodologies, which include a tissue culture step, and the time required for scoring. This has seriously undermined its application in a mass casualty scenario under radiological emergencies for timely triage and medical interventions. Recent advances in genomics and proteomics in the postgenomic era have opened up new platforms and avenues to discover molecular biomarkers for biodosimetry in the future. Using a genomic-to-proteomic approach, we have identified a basket of twenty “candidate” radiation response genes. (RRGs) using DNA microarray and tools of bioinformatics immediately after ex vivo irradiation of freshly drawn whole blood of consenting and healthy human volunteers. The candidate RRGs have partially been validated using real-time quantitative polymerase chain reaction. (RT-qPCR or qPCR) to identify potential “candidate” RRGs at mRNA level. Two potential RRGs, CDNK1A and ZNF440, have so far been identified as genes with potentials to form radiation response proteins in liquid biopsy of blood, which shall eventually form the basis of fluorescence- or ELISA-based quantitative immunoprobe assay for a high-throughput technology of molecular biodosimetry in the future. More work is continuing. One of the most widely employed histone deacetylases inhibitors in the clinic is the valproic acid (VA), proving to have a good tolerance and low side effects on human health. VA induces changes in chromatin structure making DNA more susceptible to damage induction and influence DNA repair efficiency. VA is also proposed as a radiosensitizing agent. To know if VA is suitable to sensitize human lymphocytes γ-irradiation in vitro, different types of chromosomal aberrations in the lymphocytes, either in the absence or presence of VA, were analyzed. For this purpose, blood samples from four healthy donors were exposed to γ-rays at a dose of 1.5 Gy and then treated with two different doses of VA (0.35 or 0.70 mM). Unstable and stable chromosomal aberrations were analyzed by means of fluorescence in situ hybridization. Human lymphocytes treated with VA alone did not show any increase in the frequency of chromosomal aberrations. However, a moderate degree of sensitization was observed, through the increase of chromosomal aberrations, when 0.35 mM VA was employed after γ-irradiation, whereas 0.70 mM VA did not modify chromosomal aberration frequencies. The lower number of chromosomal aberrations obtained when VA was employed at higher dose after γ-irradiation, could be related to the induction of a cell cycle arrest, a fact that should be taken into consideration when VA is employed in combination with physical or chemical agents. The methodology of cytogenetic triage can be improved by optimizing a schedule of microscopy for different exposure scenarios. Chromosome aberrations were quantified by microscopy in human blood lymphocytes irradiated in vitro to ~2, 4, and 12 Gy acute 60Co γ-rays mixed with the unirradiated blood simulating 10%, 50%, 90%, and 100% exposure and in along with a sample from a homogeneous exposure to ~20 Gy. Biodosimetry workload was statistically modeled assuming that 0.5, 1, 5, or 25 h was available for scoring one case or for analysis of up to 1000 cells or 100 dicentrics plus centric rings by one operator. A strong negative correlation was established between the rates of aberration acquisition and cell recording. Calculations showed that the workload of 1 case per operator per·day (5 h of scoring by microscopy) allows dose estimates with high accuracy for either 90%–100% irradiations of 2 Gy or 50%–90% irradiations of 4–12 Gy; lethal homogeneous (100%) exposures of 12 and 20 Gy can be evaluated with just 1 h of microscopy. Triage analysis of 0.5 h scoring per case results in the minimum tolerable accuracy only for partial. and total.body exposure of 4–20 Gy. Time.related efficacy of conventional biodosimetry depends primarily on the aberration yield in the sample, which is dependent on the radiation dose and its distribution in the patient's body. An optimized schedule of microscopy scoring should be developed for different exposure scenarios in each laboratory to increase their preparedness to radiological emergencies. Patients receiving identical radiation treatments experience different effects, from undetectable to severe, on normal tissues. A crucial factor of radiotherapy related side effects is individual radiosensitivity. It is difficult to spare surrounding normal tissues delivering radiation to cancer cells during radiotherapy. Therefore, it may be useful to develop a simple routine cytogenetic assay which would allow the screening of a large number of individuals for radiosensitivity optimizing tumor control rates and minimizing severe radiotherapy effects with possibility to predict risk level for developing more severe early normal tissue adverse events after irradiation. This study was conducted to assess the correlation between in vitro radiosensitivity of peripheral blood lymphocytes from cancer patients who are undergoing radiotherapy using the cytokinesis-block micronucleus (CBMN), G2 chromosomal radiosensitivity assays, and normal tissue acute side effects. The CBMN and G2 chromosomal radiosensitivity assays were performed on blood samples taken from cancer patients before radiotherapy, after first fractionation, and after radiotherapy. Acute normal tissue reactions were graded according to the Radiation Therapy Oncology Group/European Organization for Research and Treatment of Cancer. 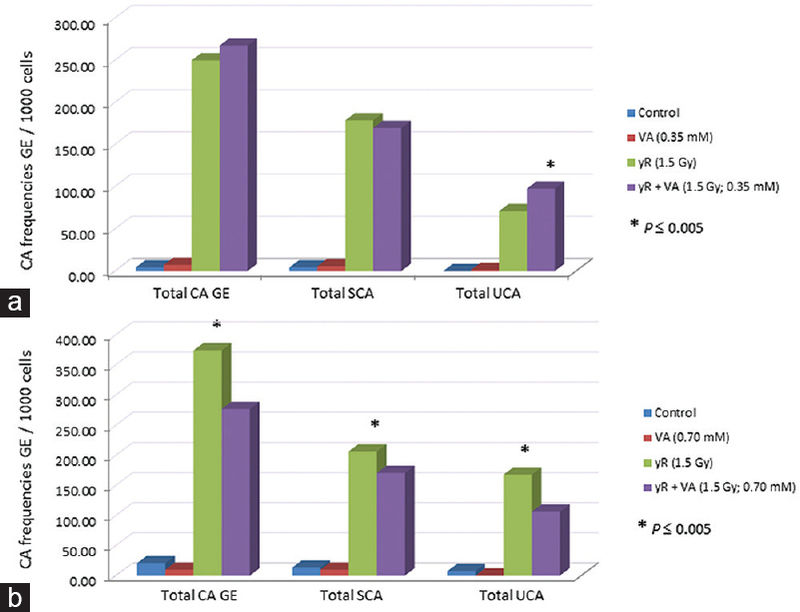 This study suggests that there is a correlation between higher frequency of micronuclei after in vitro irradiation of blood samples and higher degree of normal tissue reactions. In addition, higher number of chromatid breaks was observed in patients with more severe normal tissue reactions. This pilot study included only 5 cancer patients, and therefore, further studies with a bigger cohort are required to identify radiosensitive patients.